Promoting Italian craftsmanship in gift products, a sector where innovation in the choice of new materials and styles is ever more crucial, while at the same consolidating the positive trend in exports to the US. 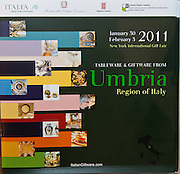 These are the objectives of the official delegation that the Italian Trade Commission (ICE) is organizing for the winter edition of the International Gift Fair (www.nyigf.com), that took place in New York from January 30th to February 3rd in the Javits Convention Center. The event was photographed for Italian Trade Commission and Regione Umbria by Jeffrey Holmes Photography, a professional New York photographer is a creative corporate event photographer. ICE has engaged him as their photographer for events and event photography New York since 2005. The International Gift Fair is considered the most important event in the North American market for the gift industry, and it takes place every six months. It typically is attended by 2,900 exhibitors, spread over a 60,000 square meter surface and was visited by 45,000 people.